The partnership of Klaus Reuter and Martin Henchion began in Leipzig in 1994, with offices established in Berlin in 1998 and in Dublin in 1999. The HRA office sustains the broadest spectrum of design interests and will gladly engage with the physical world at the scale of machine, building or landscape, that is; wherever architectural consideration can give meaningful form to new ideas. The practice portfolio is consequently diverse in scale, programme and architectural intensity, ranging from one-off private houses to cultural and community buildings, hotels and housing projects, bridges, biomes and landscapes. 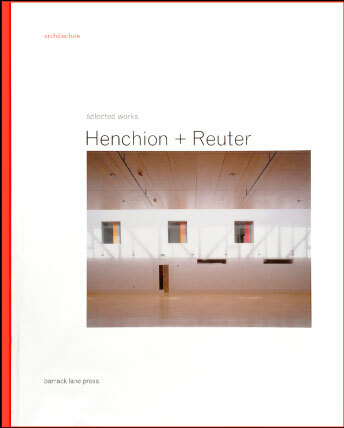 In 2016, a 214pp monograph on the work of Henchion + Reuter 2001—2016 was created. 2019 Commendation for Lahr Footbridge in German Steel Prize. 2019 1st Prize Design Competition: Leibniz Institute, Leipzig. 2019 AAI Award: Goethe Institute Dublin @ 37 Merrion Square. 2018 1st Prize Design Competition: Jahn Museum, Freiburg/Unstrut. 2018 1st Prize Design Competition: Housing at Europakarree II, Erfurt. 2018 2nd Prize Design Competition: Bastionskronenfad, Erfurt. 2018 1st Prize Design Competition: Hotel at Mount Street, Dublin. 2017 2nd Prize Design Competition: Bethel Secondary School, Bielefeld. 2017 3rd Prize Design Competition: Housing, Wittenberge. 2017 1st Prize Design Competition: Refurbishment of Schöppingen Townhall, Schöppingen. 2017 1st Prize Design Competition: Housing at Singerstrasse. 2016 2nd Prize Design Competition: Housing WBW Gebiet 3, Brühl Süd, Erfurt. 2016 3rd Prize Design Competition: Pedestrian Bridge, Lechsteg, Landberg am Lech.